The current tactical resurgence surfacing throughout the traditional Premier League top sides was expected following the arrival of some of the world’s best football managers. Antonio Conte and Pep Guardiola have already injected key elements that contributed to their respected sides’ underachievement last year. However, the stylistic shift currently taking place in England’s top division gained prominence last season. Prior to Leicester City’s triumph, the past three title winners Chelsea, Manchester City, and Manchester United were generally powerful sides that dominated possession, and were equally solid maintaining a deep defensive block when required. While that may not apply to Manchester City from a defensive perspective – a key reason as to why City was unable to sustain their success – they did possess the power to overwhelm inferior opposition. This weekend’s lunchtime kickoff between Liverpool and Spurs welcomes a different brand of football that’s replicated across the continent. Jurgen Klopp and Mauricio Pochettino enjoyed success at previous clubs outside of the Premier League, and their footballing philosophy is ground-breaking to a league that’s been criticized for losing its tactical nous. Klopp began his Liverpool career at White Hart Lane with a vision of bringing the Reds back amongst the elite sides in England, but on his return to North London the German’s philosophy has provided doubt amongst supporters. Liverpool’s growth was displayed in spurts last season, often producing their best performances when forced to play reactive, whilst receiving space to exploit in the opposition’s half. Klopp has often referred to ‘gegenpressing’ as the best play-maker: the defensive method where Liverpool swarm the ball in packs once they lose possession. It’s very successful when executed cohesively, often flustering opponents into mistakes, and enabling Klopp’s side to retain possession. Liverpool’s 4-1 demolition of then-champions, Manchester City, appeared to be a turning point in the club’s season: Klopp finally had his players on the same wavelength in regards to his philosophy and they were such demands with devastating efficiency. Although it didn’t drive Liverpool into the top four or prevent a second half collapse in the Europa League final, the breathtaking performance at the Etihad provided optimism. Likewise, Spurs press in a different manner, as their intent to win the ball close to the opposition’s box is vivid. More importantly, they clog spaces to limit passing lanes, and the defensive high-line remains high to compress space. Essentially, Liverpool’s pressing is better suited to negate counter-attacks, but both approaches can equally go wrong if it’s not a joint-effort. “It is a different style of pressing,” said Pochettino ahead of Klopp’s Liverpool debut last season. “If you analyze Dortmund, it’s not similar to how we played at Southampton. Our pressing was to the opposing goalkeeper, whereas Dortmund played with a medium block. You can’t compare Klopp’s style with my style, we are different. I’m not saying one is better than the other, just that we are different. Therefore, the one glaring issue that can unfold when two teams adopt similar defensive schemes is the possibility of cancelling each other out. Spurs’ buildup play is generally decent, but Liverpool’s first half display at the Emirates suggests they may encounter some issues. More so, while both sides are competent out of possession, their early season attacking deficiencies are concerning. Pochettino was partially guilty for overexerting his players throughout last season’s campaign, and it’s uncertain as to whether they’ve fully recovered – this specifically applies to Harry Kane and Dele Alli, however, Kane generally takes a few games before he identifies his goal-scoring rhythm. But while Spurs have evolved into a slick passing proactive side, this season, they’ve found it challenging to create chances within the final third. At Everton, they were simply out-worked and out-pressed during the first half: Kane was staved for service, while the attacking players were clearly shunted out by Gareth Barry and Idrissa Gueye. However, Vincent Janssen’s arrival tilted the match in Spurs favour, as they quickly switched to a 4-4-2 and equalized through Erik Lamela’s header from a Kyle Walker cross. Janssen was rewarded with a start in last weekend’s win over Crystal Palace, pushing Kane into a withdrawn role, but once again, from an attacking sense, Spurs were dull. Nevertheless, majority of their best moves were created in wide areas, and Victor Wanyama’s winner stemmed from a clever Lamela corner, that saw Kane direct his near post header to the Kenyan. Spurs’ attack evidently lacks width, and it’s odd that they aren’t pushing the full-backs forward with two defensive-minded holders sitting in midfield. They play clever intricate passes in central zones, but against two organized sides that adopted deep, narrow shapes – Everton and Palace – majority of their attacks were cut out. The other concern with Spurs’ attack rests in the pairing of Wanyama and Dier. Both men are powerful specimens capable of breaking up play and possess adequate distribution skills, but they simply lack the dynamism and penetrating forward runs Moussa Dembele offers from deep. Spurs can afford to field one holding midfielder against sides that prefer to adopt a low defensive block, and although Wanyama nicked the winner against Palace, the Kenyan’s attacking threat from open play is sporadic. While it’s nearly certain Dembele will return to the starting XI when match-fit, the Wanyama – Dier partnership is better suited for the Champions League and against top opposition, which is why they may strive against Liverpool’s tricky attackers. On the other hand, Klopp’s issue is more complex: Christian Benteke has been sold, and neither Divock Origi, nor Daniel Sturridge have impressed in a central role – the latter started from the right at Burnley and offered little. Klopp has often trusted Roberto Firmino in a central role, where he drops deep to invite forward runs, and makes outward runs into half-spaces to combine with teammates in tight spaces. Nevertheless, the contrast between Liverpool’s two league matches summarizes last year’s problems. When the Reds are offered space in midfield and behind the back-line they can press, bully, and out-play nearly every team in the league – Arsenal’s makeshift XI frustrated Klopp’s men in the opening half, but when they tired, Liverpool were dominant over a 20-minute period and scored four goals. Arsenal pushed men forwards in the final 20-minutes with attempts of inspiring a comeback, and though Liverpool broke into key positions in transitions, they still conceded two goals in that span, thus enduring a nervy conclusion to the match. Meanwhile, last week’s trip to Turf Moor, showcased a dull Reds attack that failed to unlock an organized Burnley side. Firmino was forced to drop into deeper positions, Georginio Wijnaldum and Adam Lallana couldn’t locate space to make penetrative runs into the box, Philippe Coutinho was forced into taking several ambitious shots from distance due to his poor passing around the final third, whereas Jordan Henderson was unable to breakup Burnley’s quick transitions that led to both goals. Klopp has reiterated his gripe with luring players to Anfield, but with a full pre-season under his belt a certain level of consistency is expected. The intricate passing combinations, fluid movement, and Coutinho wonder-goals are brilliant when Liverpool’s gegenpressing is effective, but converting territorial dominance into goal-scoring chances is preventing the Reds from moving forward as a club. Klopp and Pochettino have bucked the trend of defending in the Premier League, yet oddly, their main issue to start the season is a lack balance in the final third. With players still to return from injury and pre-season, perhaps this is a minor blip, but Saturday’s clash at White Hart Lane presents the ideal opportunity to build confidence in open play. Neither side is expected to sit deep, as it’s illogical to expect 90 minutes of full-octane pressing, and given the progress displayed by both clubs over the past few months this match is expected to represent the tactical shift within the league. But where Spurs narrow play requires width to stretch the opposition, Klopp must identify the ideal balance to accommodate his new signings in a fairly direct 4-3-3. In a league that’s most recently been criticized for a lack of organization and defensive structure, a match featuring some of the best young talent in the league may rest on whether they can maximize their creativity and goal-scoring threat around the box. To his understanding, Chelsea isn’t efficient in the attacking third, and it puts pressure on his defenders to make minimal errors. 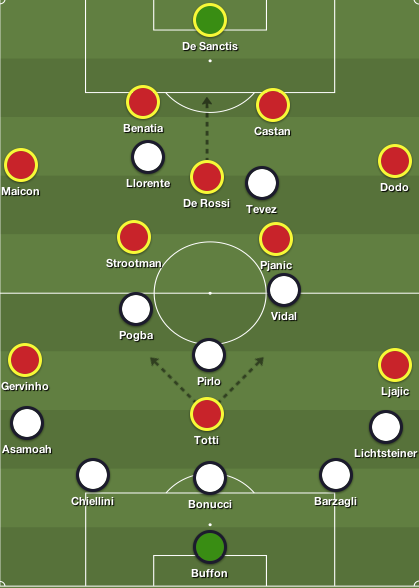 But, one could make the case that their attacking issues lie on their non-existent tactical identity, and their inability to create numerous chances in the final third. 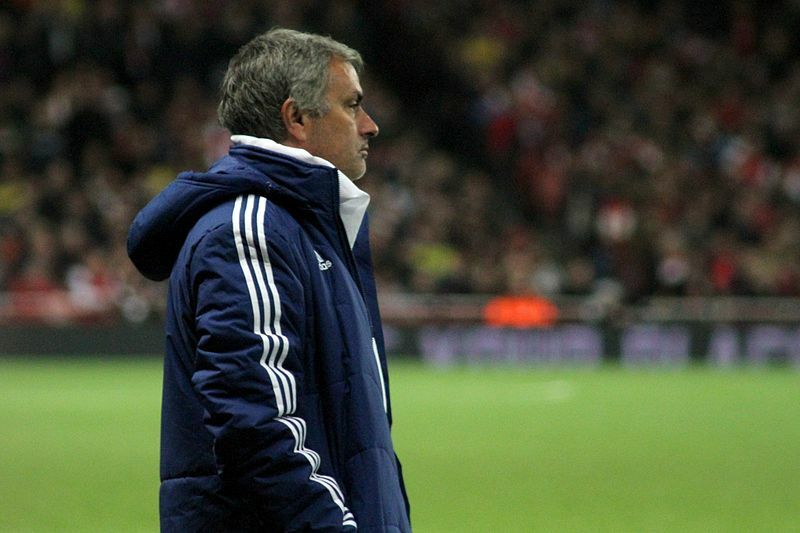 However, Chelsea displayed a different approach in their Capital One Cup quarterfinal against Sunderland. Opposed to dropping into two banks of four and solely breaking on the counter, Chelsea pressed Sunderland high up the pitch. When Gus Poyet’s men attempted to play out of the back, the West London club boxed the home side into Sunderland’s half, and won possession. Wes Brown and John O’Shea failed to cope with Chelsea’s pressure, and although Lee Cattermole dropped between the centreback duo to build attacks, Sunderland often conceded possession in their third. This was a logical approach from the away side, but similar to previous away matches this season, Chelsea was poor in front of goal. On the upside, Willian continued to shine in Chelsea’s trident. He was the best player on the pitch, completing five key passes, and completing 90 passes with a 93% pass accuracy rate. The Brazilian’s ability to retain possession in the final third is impressive, and he calmly completed numerous passes in key areas. But most importantly, his dynamism allows him to evade challenges, find pockets of space to receive the ball, and play incisive passes. Chelsea fortuitously took the lead seconds into second half, courtesy of Lampard’s persistence to attack the box to meet Cesar Azpilicueta’s cross in the six-yard box. Chelsea fully controlled the remainder of the half, and they continued to close down Sunderland in their third, but Eto’o, Lampard, and Kevin De Bruyne squandered legitimate goal-scoring opportunities. Mourinho was forced to introduce Michael Essien for Azpilicueta, as he was unable to complete the full 90, and he also opted to bring on Eden Hazard and Demba Ba. Chelsea slowed down the tempo of the match in the final 25 minutes, and David Luiz began spraying long diagonal balls to the Senegalese striker, but Ba’s impact was minimal. 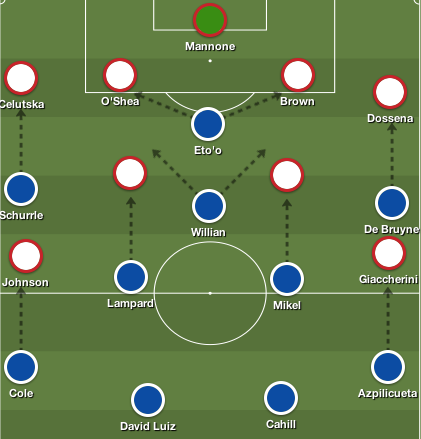 Chelsea’s inability to convert countless opportunities in the second half haunted them, when Cattermole broke past Ba’s press, and played a pass to Emanuele Giaccherini, who found Jozy Altidore in the box. 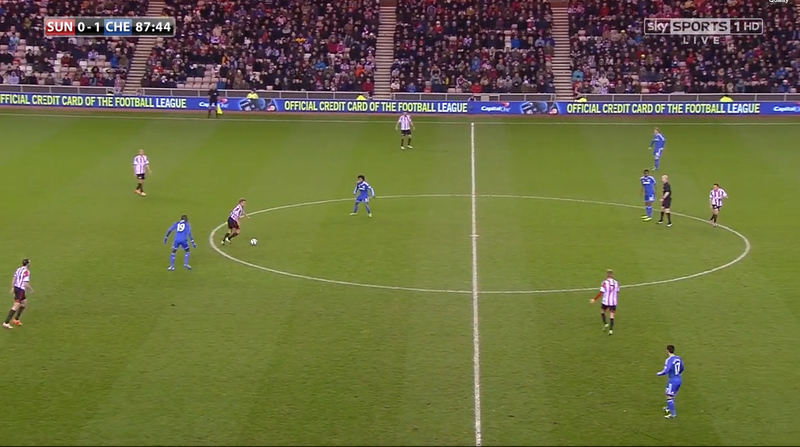 Cattermole drifts away from Ba, and plays a lovely pass into the open space ahead of him. Lampard – who isn’t in this shot – and Mikel watch the ball glide between them. 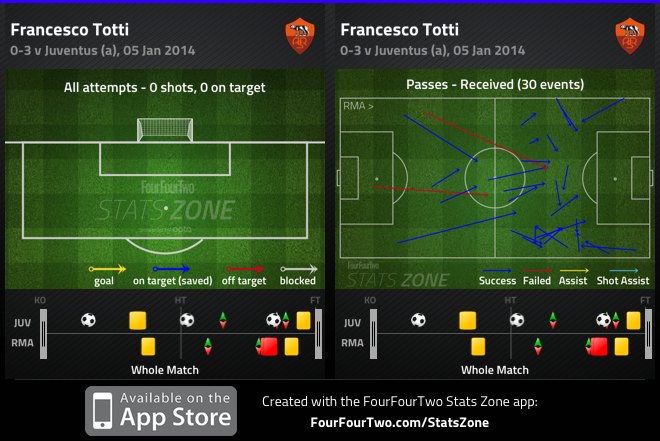 Mark Schwarzer, stopped Altidore’s shot but substitute Fabio Borini tapped in the rebound, with three minutes to play. Chelsea’s energy levels dipped in extra-time and substitute Ki-Sung Yueng’s composed finish in the 118th minute pushed the Black Cats into the semi-finals. Chelsea didn’t produce a master class performance, but they were the better side for majority of the match. Although Chelsea doesn’t possess a tactical identity and have several areas in their squad to improve, the manner in which they’ve lost domestic away matches has been similar. Mourinho’s men may not be playing the best football, but they’ve put themselves in situations to win matches – however, they dissipate too many opportunities in front of goal. Chelsea’s high-pressing approach was successful, but it caused them to tire in the latter stages of the match, and Poyet’s energetic substitute’s instilled belief, and produced goals. Brazil win their fourth Confederations Cup in convincing fashion, producing a dominant performance at the Maracana. Luiz Felipe Scolari made no changes to his starting lineup – he’s only tinkered with his lineup when Paulinho was unfit to play against Italy in Brazil’s final group game. This meant Brazil played in a 4-2-3-1 with Fred leading the line ahead of Oscar, Neymar and Hulk, while Paulinho and Luiz Gustavo played in the double pivot. Vicente Del Bosque made one change to the side that defeated Italy midweek, introducing Juan Mata into the attacking three alongside Fernando Torres and Pedro Rodriguez. Del Bosque stuck with his midfield three of Xavi, Andres Iniesta and Sergio Busquets, while Cesc Fabregas, Javi Martinez, David Silva and Roberto Soldado sat on the bench. Brazil’s constant pressure disrupted Spain’s passing rhythm and their direct play exposed the space behind the Spanish midfield, which led to their superiority throughout the match. Strikers have been a talking point in Brazil over the past few years, because they have been heavily criticized for not possessing a world-class striker. Fred has been in and out of the Brazilian national team since 2006, but has finally delivered and possibly made a stake for a starting spot in next year’s World Cup, if he stays fit. Fred may not be the flashiest striker, and is far from being a legitimate world-class player – he is a natural poacher, which blends in with Brazil’s versatile attack. Fred scored five goals in five games, four of which came against arguably the two best European sides in Italy and Spain. But besides goals, Fred offers more to Scolari’s side – his ability to lead the press, link play with the three attackers behind him, and his movement off the ball has seen him flourish under Scolari. Fred’s ability to hold up the ball and play in advanced runners, and the several defensive headers on Spain set-pieces will be overlooked, because of the two goals he scored, but Fred has displayed why he has all the qualities to lead the line in the future. A common feat in Brazil’s performances throughout this tournament has been their energetic starts. High pressing, and wing play have been key in the opening minutes of their matches, but we’ve often seen both energy and pressing levels dip throughout the match. Surprisingly, Scolari’s men were able to sustain their energetic pressing, as they did against Italy, which disrupted Spain’s passing rhythm and prevented Del Bosque’s men from settling into the match. Spain was unable to build attacks from the back, as the Brazilian attackers closed down Gerard Pique and Sergio Ramos, while Oscar stayed close to Sergio Busquets. Brazil quickly hounded the ball when they were dispossessed and Spain was forced into several errors, often conceding possession. It’s key to note that Brazil’s double pivot’s physicality proved to be vital. Gustavo tracked Iniesta, and although the Spanish midfielder produced moments of magic, he had little influence on the match. Xavi also struggled to dictate the tempo of the match against Paulinho, and this forced him to drop deeper into the midfield to receive the ball. Brazil was brave with their pressing – they didn’t allow Spain to set the tempo of the match and play out of the back – they simply modified the approach Italy took in the semi-finals, the difference was they were ruthless in front of goal. Spain strayed away from their beloved 4-2-3-1 system and opted to play a 4-3-3 throughout the tournament. With Xabi Alonso unavailable due to injury, Busquets was given the duty to protect the back four alone, like he does for Barcelona. This was an odd move by Del Bosque to stick with this system throughout the tournament – especially when you have arguably the best player in that position in Javi Martinez that can provide physicality and key passes, on the bench. The system change was positive going forward – Spain looked to be more fluid in their attack, as they created more legitimate goal scoring opportunities. While this was true, the reason why Del Bosque introduced the double pivot upon his arrival as Spanish manager was to not only protect the back four, but also prevent sides from exposing Spain on the counter attack. Throughout the latter stages of this competition, Nigeria, Italy and Brazil began to penetrate spaces behind the advancing Alba and behind Busquets, and they were keen to play on the break because they found it relatively easy to drag Spain out of position. This, along with fatigue, could be the main reason why Spain failed to press Italy and Brazil higher up the pitch. Del Bosque possibly noticed the space Nigeria received between the lines, and that Uruguay exposed once Forlan was introduced. Nevertheless, it played into Brazil’s hands, as Luiz Gustavo was able to receive the ball in deep positions because Xavi refused to press the Brazilian midfielder in those areas. Brazil was now able to play from the back – they often played direct balls into Fred, so he could play in the attacking three or to Hulk so that he could isolate Alba. Del Bosque’s attempt to move away from the double pivot benefitted his side going forward, but against teams that constantly pressed Spain higher up the pitch, it became a defensive liability. It was no surprise to see Del Bosque look to his bench in the second half, but the fact that his changes had little impact on the match was shocking. Cesar Azpilicueta replaced Alvaro Arbeloa, and although he didn’t have a poor outing, one could argue that the Chelsea right back could be held responsible for Brazil’s third goal. Jesus Navas replaced the uninspiring Mata, as a direct threat – this pushed Pedro to the left flank and Spain improved going forward, and Navas’ impact resulted in a penalty shot that Ramos missed. Del Bosque’s final change was to introduce David Villa for Torres. Torres didn’t receive much service, but when he did, the Spanish striker was often outmuscled by David Luiz and Thiago Silva. Torres dropped deep to receive the ball, but struggled to turn on his defender and play in Mata, Pedro or Navas. The best chance Spain received through Torres was when Pedro was played in by Mata, but he was denied a goal due to David Luiz’ heroic block. It was interesting to see Del Bosque keep a player like David Silva on the bench – Silva would have been an ideal replacement for the isolated Torres, to provide Spain with more passing options and he possesses the ability to open gaps in Brazil’s back four. Del Bosque’s attempt to get Spain back into the match failed, and once Piqué was sent off, his side was forced to defend for the rest of the match. Brazil outwitted an extremely tired Spanish side with high/energetic pressing, quick direct counter-attacks and ruthless finishing. Scolari’s men end the tournament unbeaten, and more importantly they look to be heading in the right direction for next year’s World Cup on home soil. Prior to the tournament, many were worried about Brazil’s tactical discipline and the cohesion between the front four, and throughout this tournament Scolari has ironed out those issues. There are still questions as to whether Hulk will be in the starting eleven next year, with the rapid growth of Lucas Moura, but Scolari has completed a job – he found his potential starting 11, molded them into winners, and has turned the Brazilian crowd into believers. Spain once again fail to win the Confederations Cup, and fatigue, along with Del Bosque’s selections have played a role in their failure. Four major tournaments in five years has taken a toll on this Spanish side, and it showed towards the end of the tournament with their lack of pressure and energy. Del Bosque experimented with a 4-3-3, and has failed to get the best out of a few players in this system. When Spain failed in 2009, Del Bosque was forced to make a few changes to find the right blend of players/system and he’ll need to do so again if he intends on leaving the Spanish post a champion.